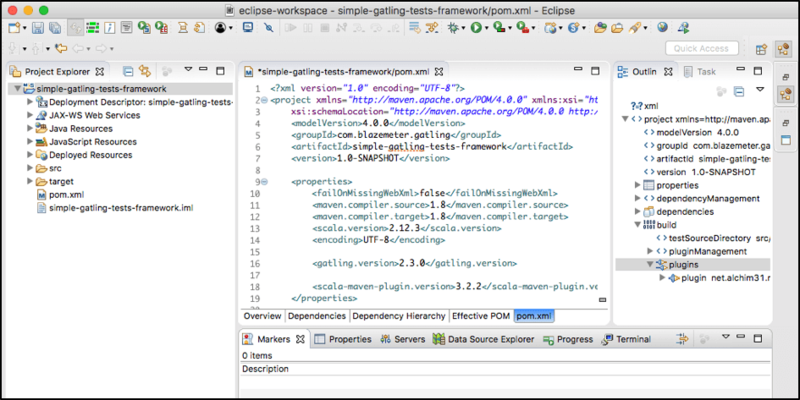 Since some developers may prefer to use Eclipse IDE to run their testing environments, here is a screenshot-packed tutorial to guide you along the way. In one of our previous articles we went over the required steps to setup your own Gatling test's implementation environment. 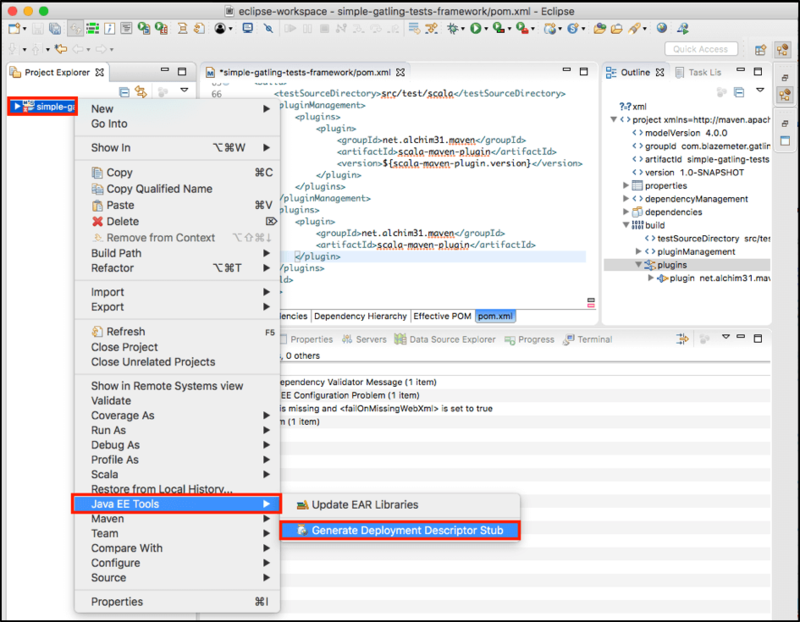 We used an IDEA IDE development environment as the main target example of the tool to be used as an environment for test creation. 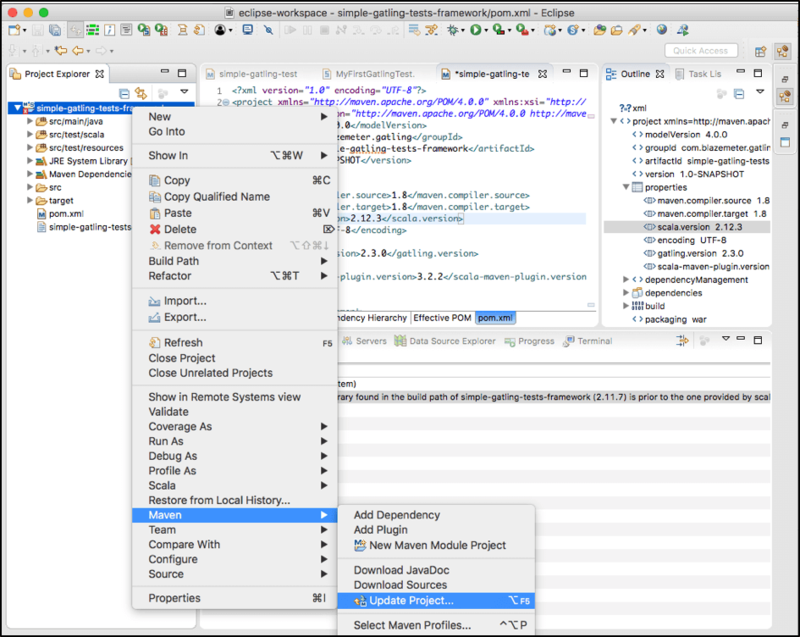 At the same time, there is another IDE that is widely used by many developers who create performance tests using the Gatling framework—Eclipse IDE. Eclipse has a much longer history than IDEA and many people use it and love it. If you haven't used any of these tools, you shouldn't find any big differences between them if you just need them for Gatling tests implementation. Personally, I prefer using IDEA in all cases just because it perfectly fits my daily needs (for example, my favorite programming language is Kotlin which has a much better integration with IDEA rather than with Eclipse). But I truly respect the opinion of other developers who prefer using Eclipse. I strongly believe that you should choose tools that you are comfortable to work with, if you have such an option. Gatling is based on the Scala programming language and you need to use Scala to write tests. 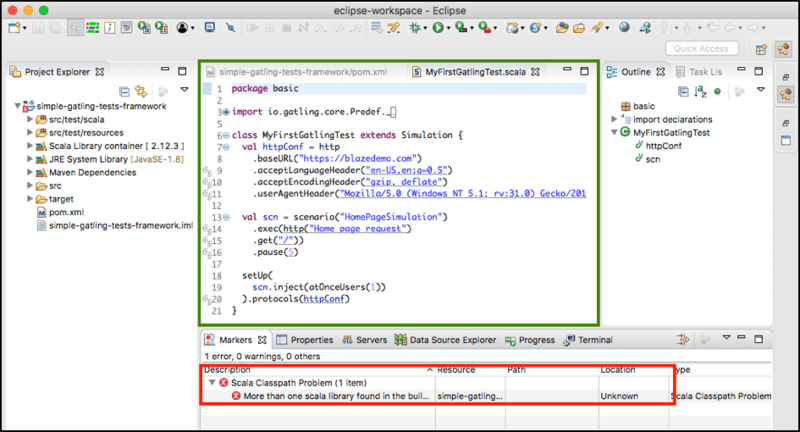 However, Eclipse doesn't have built-in Scala support and sometimes even experienced programmers have trouble running Gatling tests using their favorite Eclipse IDE. That's why I thought that a step by step tutorial will be useful for those who might experience the same troubles in future. 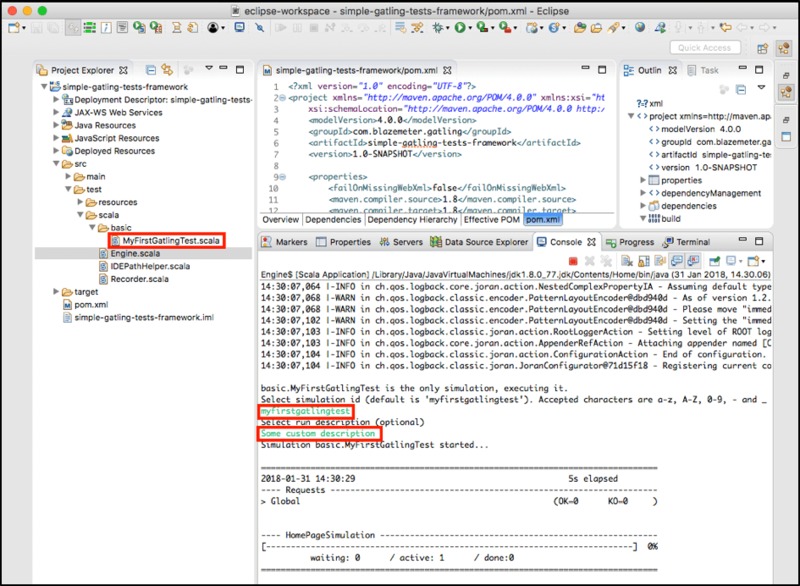 In this article we are going to cover all the steps required to use the Eclipse IDE as your main development tool for Gatling tests' implementation and execution: setting up, configuration and running the tests. If you haven't installed this plugin before then you should see the 'Install' button on the right. Just click and proceed with couple of trivial installation steps. You can use the default selection for all the windows that you will get during the installation process. 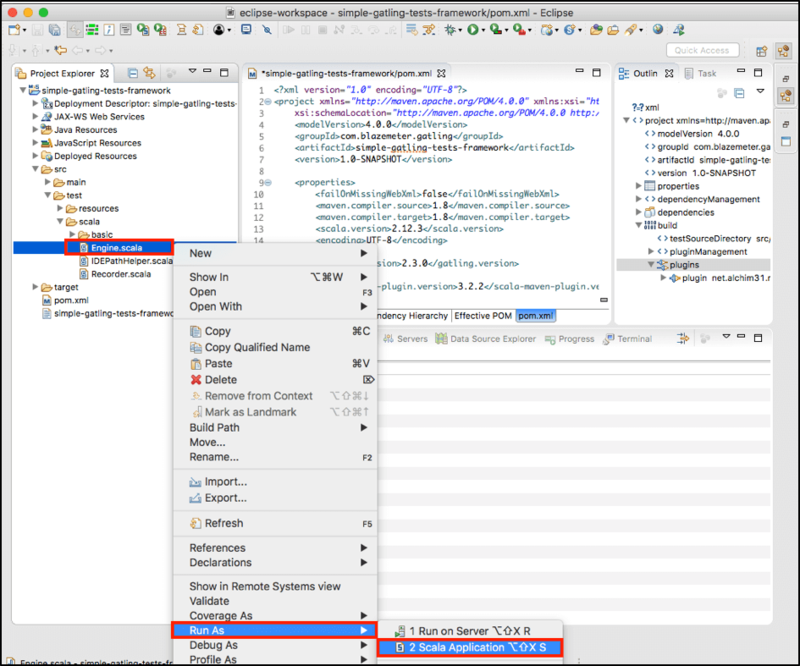 Next, you need to take a configured Maven test project with the Gatling framework and some tests, or you can use the one we have created for testing purposes in this blog post. It might look confusing but you don't need to worry at this point. You can not do anything with this error during the project import but you can easily fix it right afterwards. Right after this action you should get rid of tons of the errors and all the Scala files should be error free from this moment. "More than one scala library found in the build path:/Applications/Eclipse.app/Contents/Eclipse/plugins/org.scala-lang.scala-library_2.12.3.v20170725-052526-VFINAL-6ac6da8.jar, /Users/ybushnev/.m2/repository/org/scala-lang/scala-library/2.11.7/scala-library-2.11.7.jar). At least one has an incompatible version. Please update the project build path so it contains only one compatible scala library"
Ideally, if you see an error inside your project, you should deal with it right away. Even if the error doesn't produce a negative impact and you still can run your tests without visible issues, you need to take care of all the errors first, as they might produce some unexpected results. That's it! 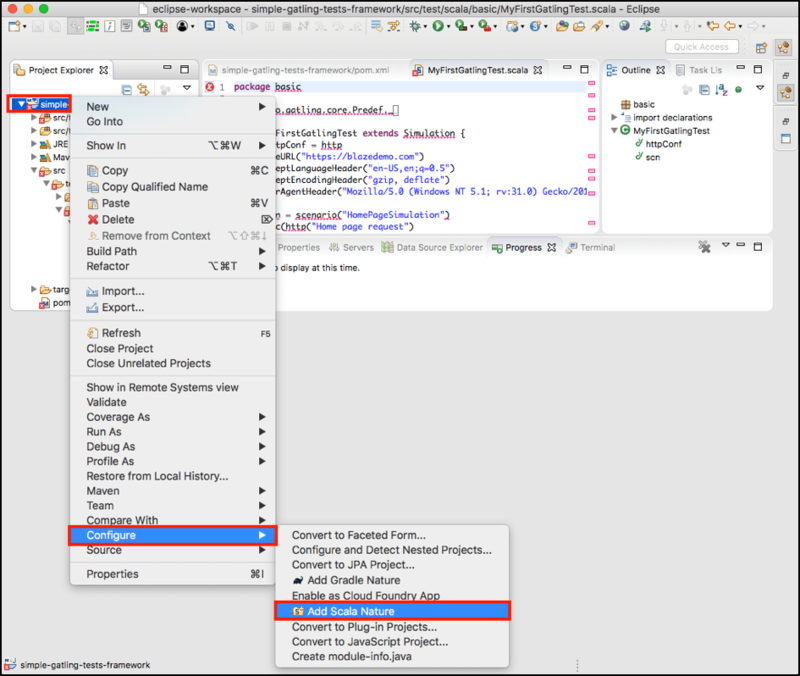 We just installed all the required prerequisites, fixed a couple of trivial issues and we are ready to use the Eclipse IDE as the ultimate tool for Gatling test's creation. 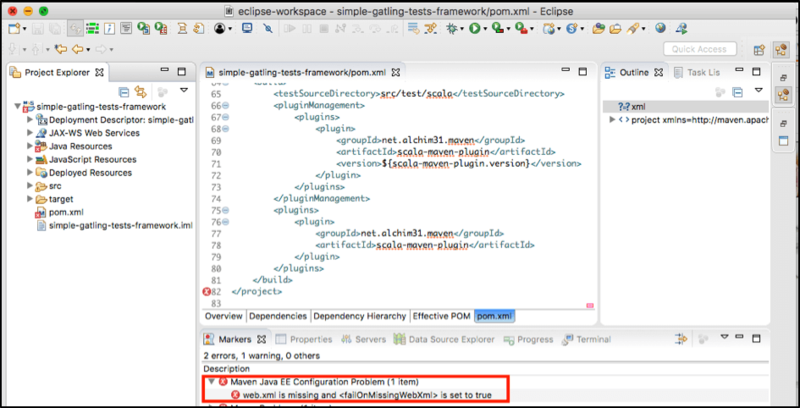 I hope this article was useful for those Eclipse lovers who did or will struggle with the configuration of Eclipse IDE for Gatling performance testing needs. You can also run your Gatling load test in BlazeMeter, and enjoy cloud scaling and advanced reporting. Try us out by putting your URL in the box below. Or, request a demo. Published at DZone with permission of Yuri Bushnev , DZone MVB. See the original article here.